For a while now there has been a discussion and a good deal of academic and practitioner attention placed on developing good community participation tools, ‘best practice models’ if you like for community participation. And there are now some fairly rigorous models for community participation. 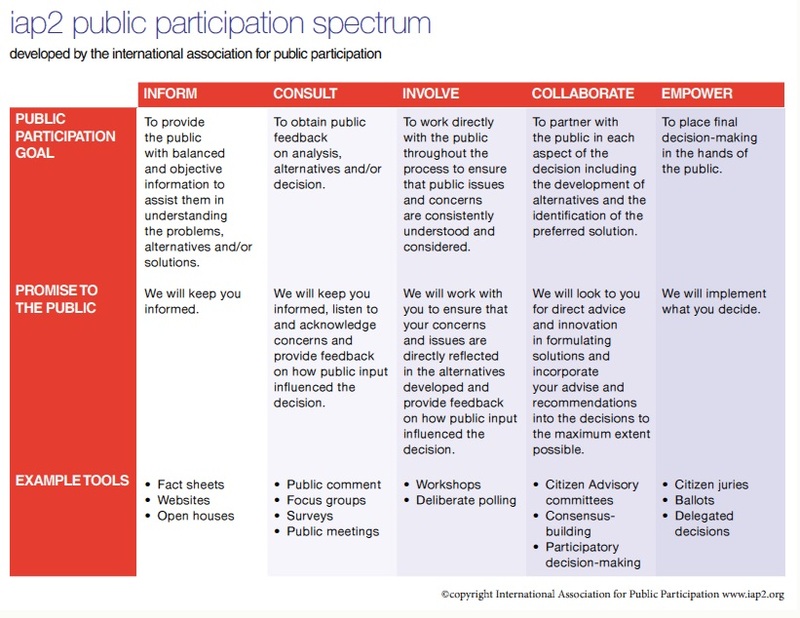 Models and participation techniques, such as IAP2’s spectrum (below), which provides both a theoretical rationale and practical communications tools that have been rolled out in a range of government settings in Australia. The IAP2 model outlines the types of activities you might like to undertake, inform, consult, collaborate etcetera across the top. And then we see some familiar techniques for undertaking ‘direct democracy’ down the bottom, ‘citizen juries’, ‘delegated decision-making’ etcetera. What is missing from this model and many community participation spaces is the way, the method or the process, by which these techniques of direct democracy will be incorporated into our of system representative democracy. What is missing here is the broader social and political context in which these participation techniques are practiced; it is this context that is key. This can create a huge tension between expectations and realities for tenants. Tenants want to talk about the broader social and market context as well as their local housing issues. Sure, there might be formal requirements for government and social housing providers to undertake tenant participation at the local level, but tenants often report they can’t discuss or be involved in decisions about, for instance, the move from ‘public’ to ‘social’ housing, or the forced relocation of tenants. They state they can only discuss local issues such as maintenance, or small changes within predetermined policy frameworks, and not the policy frameworks themselves. And tenants want to talk about both, yes they want to be involved in the formal tenant participation spaces with government and social housing providers, but they also want to be involved in other political debates that directly affect their lives. Source: Marg Barry Memorial Lecture and 2012 Democracy from the ground up: the real stuff of community engagement. Also see separate article The Real Stuff of Community Engagement which was also drawn from this lecture.